Well, I've got a little news to share from Your Next Stamp. Today is our first day as a MEMBER COMPANY on SPLITCOAST!! Isn't that the coolest!?!? We have a brand spanking new SCS forum where we can gather our thoughts and share our projects, questions and favorite ideas about "all things" Your Next Stamp. AND, to kick it off, we've put together a little BLOG HOP to jump start the celebration. We have 3 hidden prizes along the way, so make sure you comment on all of the DT blogs for your chance to win! The hop will run from today, May 1st 11:00 am (EST) until Sunday, May 6th at midnight (EST). Winners will be announced Monday, May 7th on the Your Next Stamp Blog and in our SCS Forum. Most of our YNS team made 2 projects, but I just made the one because I will have my regular FUN FRIDAY SUSIE Q-TIP this Friday, so stay tuned! I started with my favorite Ellie image to date--Ellie Loves Lattes (and so does Susan, so please send Starbuck's cards. Thanks.) I had so much fun coloring her, especially her hair! I usually always blend it all out with my Copics, but this time, I left some of the streaks and highlights. I wish my hair looked that good! I need a haircut like there's no tomorrow! Oh and another latte, please! 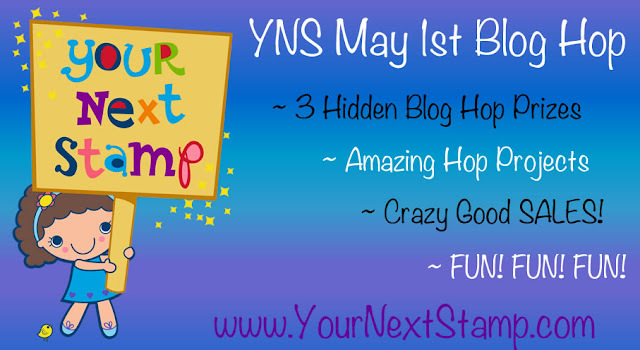 Now it’s time to hop on over to Wendy's blog for another awesome YNS project! Thank you for celebrating with us, happy hopping, and we'll see you in our SCS forum! But before ya'll go: Karen (our YNS owner) is also in the process of moving, so she is having a MOVING SALE! Quantities are limited, so shop early to grab the stamps and dies you want at a fantastic deal! There is also a Retired Stamp Bin (70% OFF!!!) and a Bargain Bin so make sure you check out all of the awesome deals at the Your Next Stamp Store! SUSIE Q-TIP: When a stamp's sentiment "shape" or "length" doesn't work for the layout of your card, you have 2 options. Either cut the actual stamp and place each word where you want it on the sentiment panel, OR stamp the sentiment "as is" and cut the words out and place them however you want them on your card or project. I've done both and have never regretted cutting my stamps up. Great job colouring my favourite image ~ Ellie Loves Lattes! I love all the coordinating blues. Great card! super sweet card! love the coloring Susan! What a wonderful card! Coloring is great and I love the combination of papers and that fantastic doily die! Cute card ....love the image and how you coloured it. I also like the doily placement. Oh -- how sweet! Love the doily, your colouring and your finishing touches. Nothing seems overdone or out of place. A very well thought out card. Sorry -- can't send you a Starbucks card, but will sip on a tea and hope you will have a beverage in hand while reading through your comments! This is my favorite stamp from YNS. Great card. This is my favorite stamp. Cute card. Wow beautiful card! I love your coloring too, so good! Hi Susan! Ellie looks so cheerful and happy and who wouldn't be holding a delicious cuppa joe! Love all your coloring (her hair is outstanding) and fun layers. Such a bright and cheery card! Susan, wow what a fantastic card! I love the doily and all the layers you added. You have coloured the image so beautifully! Great job! Susan, your card is just fabulous! I am in awe of your card design. LOVE it, and everything you do! SO CUTE!!!! I need a haircut and latte too please! LOL Love the colors you chose for this super sweet card! Oh my! This is too cute! Thanks for sharing! Loving Ellie with the Latte! That's my kinda girl!!! Very cute! Wow! You did a FABULOUS job on her hair! I really want to learn to color like that. BTW...I checked "cool" for this project, because it really is! Great card--I like your coloring and always appreciate your tips. NO WAY! Love this little latte girl. She HAS to come live with me, lol. Colorful and fun, and on this dreary day, I want to be snuggled up with a latte, too!! Thanks for the inspiration! Beautiful card. Ellie with her latte is so cute. Love this Ellie card 'a latte'! :) Super cute! I love how you colored her hair and gave it depth and highlights. Thanks for sharing (your cards and your tips). This is so darling! I love your gorgeous coloring, your tips and the Doily die. Great card! I love her hair.